The prototype of Avril comprising of a power head and two passenger coaches was exhibited at InnoTrans, International Trade Fair 2012. Image courtesy of Bucyrus. 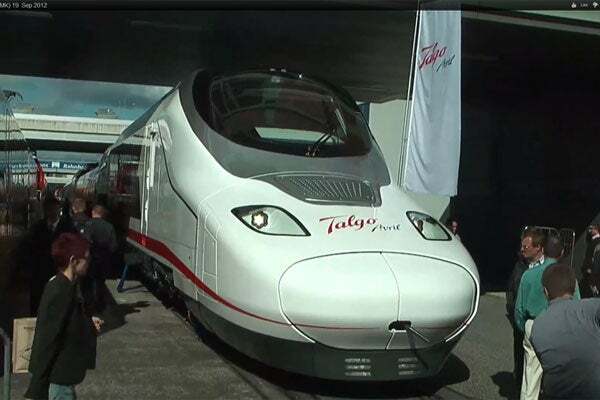 The nose of Avril is similar to Talgo 350's duck nose. Avril will have a maximum speed of 380kmph. Avril, which stands for Alta Velocidad Rueda Independiente Ligero (Light Independent Wheel High Speed), is a very high-speed train from Spanish train manufacturing company Talgo. The prototype of the train, which comprises a power head and two passenger coaches, was exhibited at InnoTrans International Trade Fair 2012 by Talgo. "The Avril is designed to possess a speed of 380km per hour." The Avril is designed to possess a speed of 380km per hour. Its design is based on various innovations gained from Talgo’s expertise in manufacturing high-speed trains such as Talgo 350 (T350) and Talgo 250. The Avril Train project commenced in 2009. Talgo received a €50m ($67m) loan from the European Investment Bank (EIB) in December 2012 to support its research, development and innovation (RDI) investment programme, which primarily aims at developing the Avril Train. Talgo is expected to benefit from Spain’s race for a high-speed rail network through the development of trains such as the Avril. Incorporating Talgo Technology, Avril will provide improved accessibility and mobility with low floor coaches, accommodating disabled passengers. It will consume less energy due to its lightweight construction, and generate less CO2, noise emissions and vibrations. The single-floor high-capacity train will have a width of 3,200mm, a length of 201.9m, and a height of 3.33m. The maximum weight of the train will be 315t. The exterior of Avril was designed by Pininfarina. With its nose similar to that of Talgo 350’s duck nose, Avril will comprise front and rear powerheads with 12 trailers. The car bodies will be built of extruded aluminium sections. The exterior dimensions of the car bodies will be smaller than that of the conventional trains by 25% to 30%, reducing its aerodynamic resistance. Talgo 350 (T350) is a very high speed train developed by Patentes Talgo (Tren Articulado Ligero Goicoechea Oriol), a Spanish company. It is manufactured by the consortium of Patentes Talgo and Bombardier Transportation. Avril will have lesser axles and thus lesser wheels. Offering interoperability, the train can automatically switch between 1,435mm, 1,668mm and 1,520mm gauge tracks on either fixed gauge or variable gauge systems. The traction system is designed for four tensions. The very high-speed train can be customised to either run on electric or both diesel and electric. It can also be customised for use on a tilting system. Avril will feature a quad voltage electric drive which can function under both AC power of 25kV/50Hz or 15kV/16.7Hz and DC power of 1.5kV or 3kV. The interior design of the train is the result of a design proposed by Haslacher. The train will feature wide leather seats and wooden tables. Ample natural light will be provided by its wide windows. Seating arrangement in the economy class of Avril is of a 3+2 configuration, enabling it to carry approximately 600 passengers. The extra width of Avril compared to conventional high-speed trains will enable it to include an extra row of seats. The wider-body shell complies with the UIC standard clearance gauge. Liebherr will develop and manufacture a car body positioning system for Avril. The system will centre the train actively on its roll axis, act as a damper, provide higher speeds and comfort, and enable the trains to gain a wider car body. "The Avril Train project commenced in 2009. " Constellium has been contracted to supply the aluminium semis and interior floor panels, provide design assistance, and carry out stress analysis of the train’s body-shells. Indra developed the European Train Control System (ETCS) for the train. System integration for the traction chain and SW specifications for the entire power head is being carried out by Railtec Systems. The company will prepare the purchasing specification for the traction chain, and provide the design solution for the train control and management systems (TCMS) and SW specifications for the power head.